The Twin WiMAX RF Transceiver is a 19-inch, rackmount, two-channel, WiMAX, analog RF front end designed to work with Lyrtech advanced development platforms. 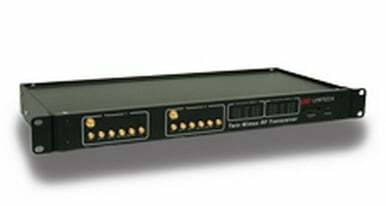 The transceiver covers the WiMAX 2.5 GHz band (2.3-2.7 GHz). When it is combined with Lyrtech's SignalMaster Dual or SignalMaster Quad, and the ADACMaster III, the transceiver becomes a complete and integrated hardware/software development solution for advanced WiMAX development. The front end also covers all the ISM bands and makes all sorts of Wi-Fi (b, g, n) applications possible.